Imagine this: Five eminently stylish and hilariously witty gay men -- authoritative experts in food and wine, grooming, decorating, fashion, and culture -- invade your life, assess your strengths and weaknesses, and, in the course of a day, make you better dressed, better groomed, better mannered, and a better cook, living in a better home. All of this is painless (unless you have a really egregious body-hair situation), liberating, and downright fun. This is what Queer Eye for the Straight Guy does each week on one of the hottest TV shows in memory, as the Fab 5 -- Ted Allen, Kyan Douglas, Thom Filicia, Carson Kressley, and Jai Rodriguez -- turn an everyman frog into an every-girl's-dream prince. And this is what the book offers: the essential "make better" advice from each of the Fab 5. Just like the show, the book focuses on easy but lasting lifestyle transformation -- the tasks, the projects, the modest purchases, and, most important, the new attitudes that immediately make a noticeable difference. 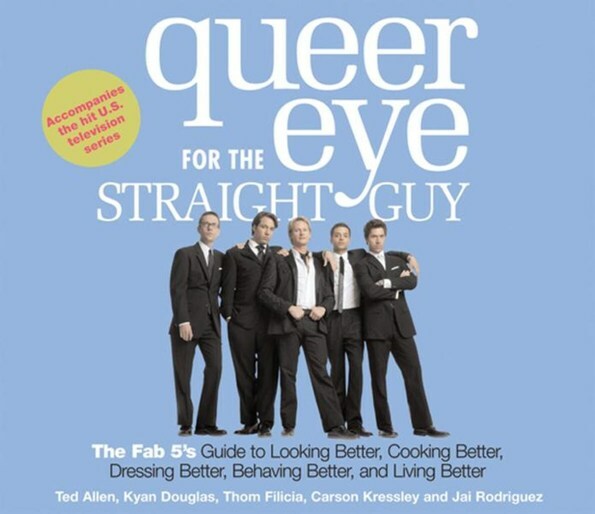 From Kyan's instructions on how often to wash your hair to Carson's explanation of why shirts are the new ties, from Ted's strategies for ordering wine and Thom's suggestions on a better bathroom to Jai's hints on shaking hands, Queer Eye for the Straight Guy is filled with clear, direct advice on the issues that confront every man. But Queer Eye doesn't try to make you dress like Carson or dance like Jai; it's about teaching you how to refine your own personal style, without throwing away your entire closet and buying a whole new everything. It's about helping you realize the best expression of yourself -- the real you. Queer Eye introduces men to the rewards that women -- and a lot of gay men -- have long reaped by thinking about the day-to-day details that make them look better, feel better, and get more out of life. Many straight men have long felt that these subjects are not for them. Nothing could be sillier. In this book, the Fab 5 sets them straight (so to speak).